So Aussie is done. 28 days, 3 cities, about 20 bike rides and many more trips by train, tram, ferry and car. Of course I am going to say “brilliant” – because what will stick longest in the memory will be the high points. 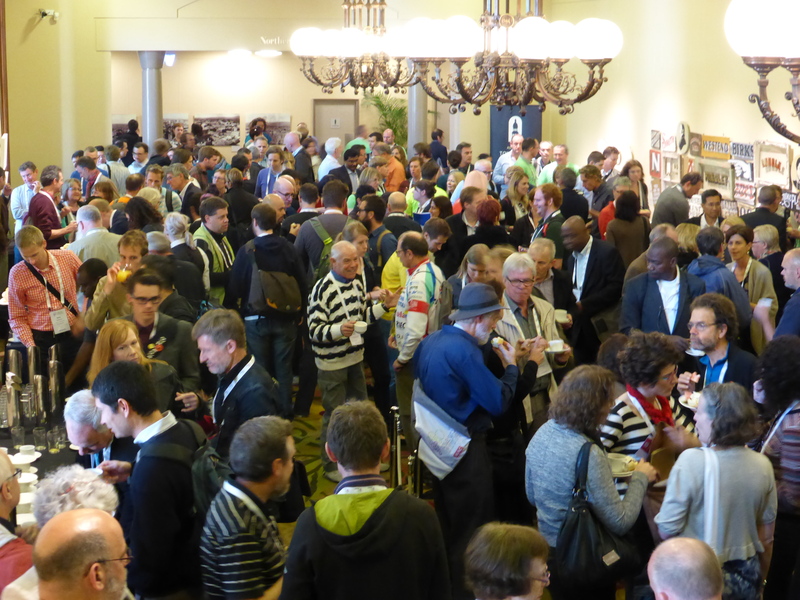 Velo-city Global 2014 was full of inspirational people and I met many more en route. And I had some excellent rides that will always be fond memories. 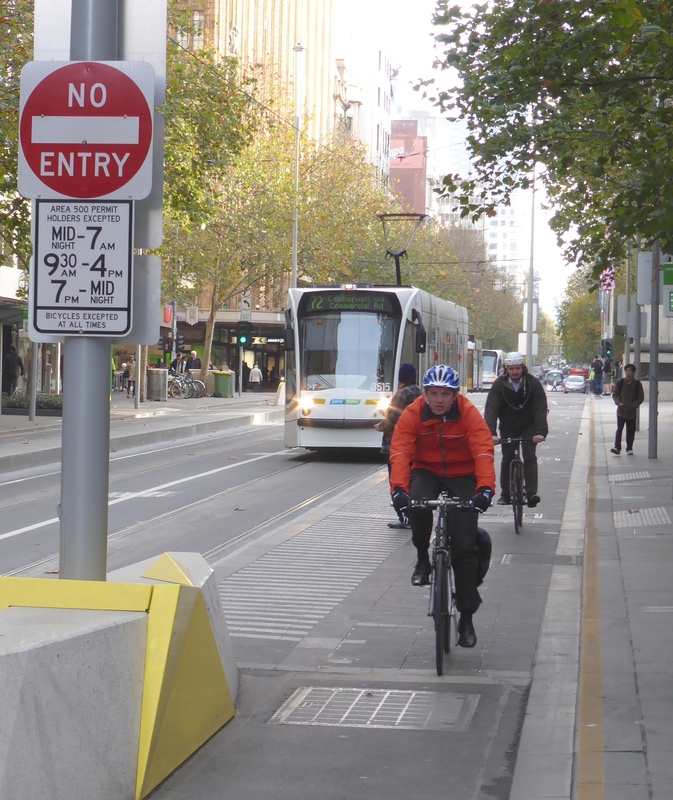 I had hopes for a strong cycling presence on the streets because I had heard that there has been something of a renaissance of cycling levels, especially in Melbourne and Adelaide. But when I reflect further on my overall impression of cycling and cycling culture in the three cities I visited I am more inclined to say “curious” and even “challenging” because there are many aspects that present our Australian cycling friends with big challenges. If there is going to be great cycling in cities the opportunities don’t fall in to place by accident. Things happen because there is some mix of advocates, politicians and technicians who have vision, passion and influence. 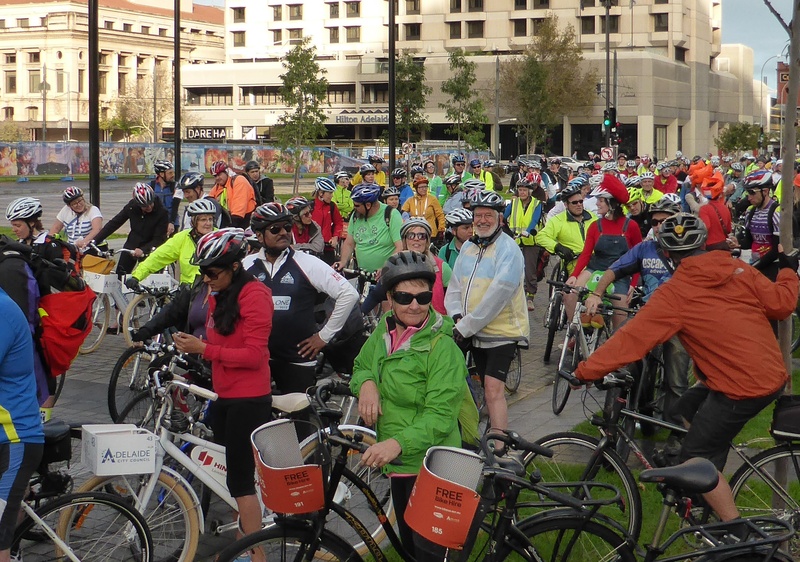 And faced by the challenges of their cycling culture they are willing to stand up and be different, starting to promote cycling as a mass activity not just a sport. There is no doubt in my mind that those people were at Velo-city and across Australia. Politically our Adelaide host was Lord Mayor Stephen Yarwood who was a role model on the podium and at events like the Big Bike Brekkie where he seemed more like the Europeans by turning up in his day clothes and just riding. Most advocacy organisations in Australia are not huge and are heavily reliant on events to boost membership and pay the bills. But Bicycle Victoria is per capita possibly one of the biggest cycling advocacy organisations in the world with over 40,000 members from a population of just 5 million, hugely impressive. The other organisations are no less passionate if perhaps not as big. The other community we met were the local promoters, entrepreneurs and activists who were great fun and great to be around. And of course in that community a huge shout out to Tina McCarthy our ride host in Melbourne. Her boundless energy and enthusiasm is infectious. There are lots more people I could mention and many more who I didn’t meet but heard about and read their valuable contributions to the Velo-city discussions. I have no doubt that I was among friends and fellow travellers on the road to more cycling and I have to thank them for being great hosts. The second bit of good news is that things are happing on the ground. At the moment the amount of really high quality cycling infrastructure is very limited so the signs have to be considered “green shoots”, especially because the quality infrastructure in the cities is far from established. 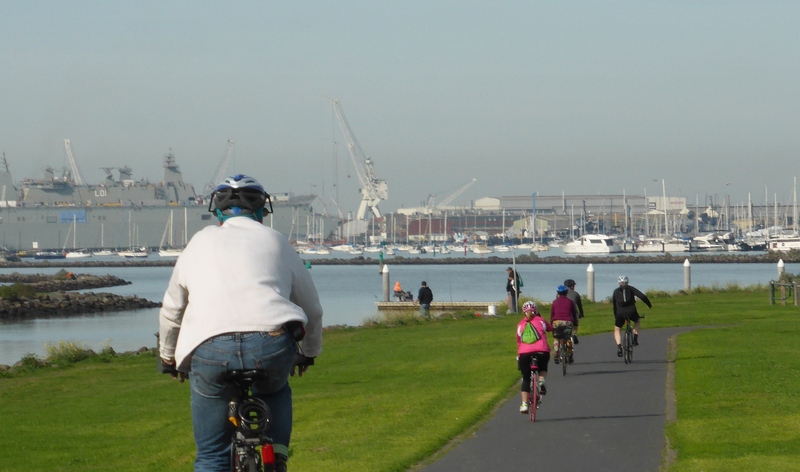 The one high quality cycle route in Adelaide was only part finished and already there is a vote at the state parliament to try and get rid of it. 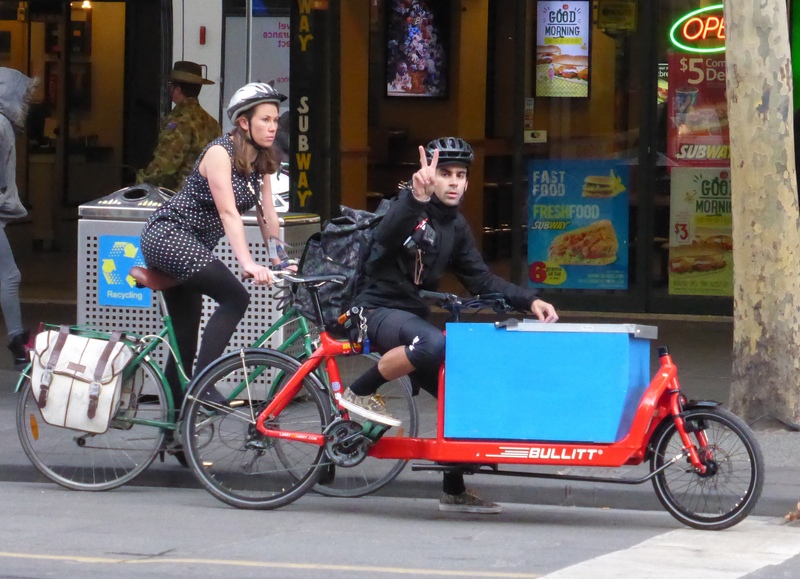 However in central Melbourne I saw that the much more established infrastructure was working because there were many more riders and some of them were not the usual suspects in lycra, this felt much more like a cycling city with a wider selection of riders. The urban leisure infrastructure is well established and well used. 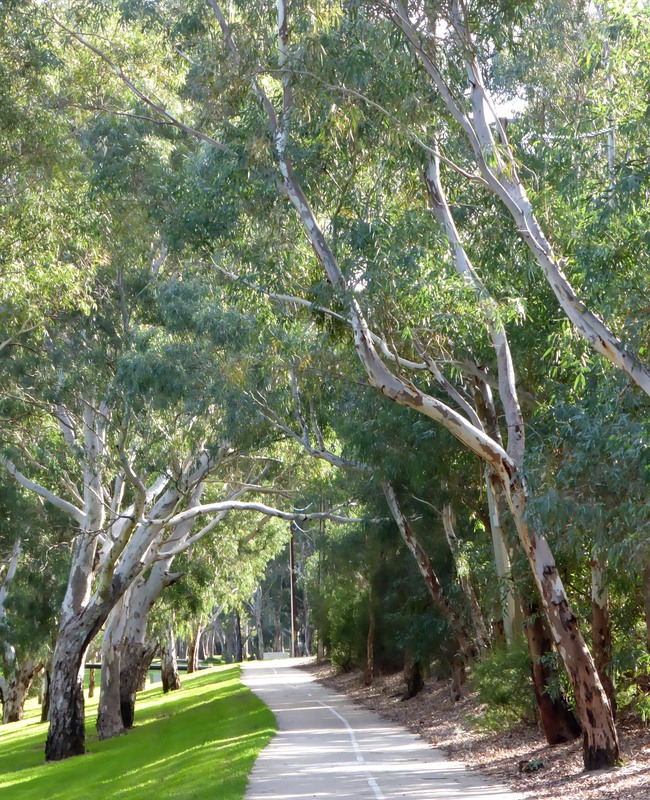 I have posted how much I enjoyed the River Torrens route in Adelaide, the round the bay routes in Melbourne and the Olympic Park in Sydney. 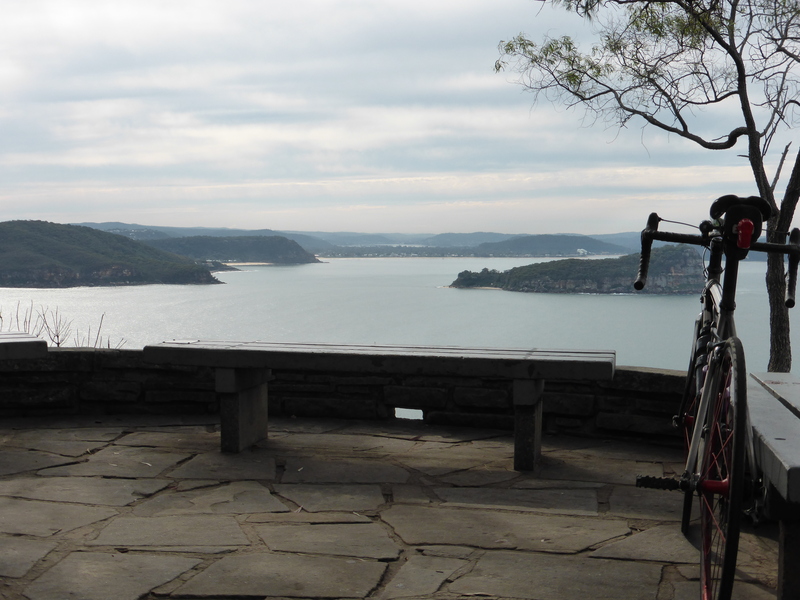 As well as the urban routes I will long remember my ride out to West Head in Sydney’s Ku-Ring-Gai Chase National Park, it was spectacular. And these leisure routes were being used, there was a steady drip-drip of cyclists on all of them. So on reflection I can report that these three Australian cities gave the impression that they could be joining the international group of “starter” cities that have begun their cycling revolution and could move up to next level where cycling starts to take a proper place in transport. This revolution currently looks different to anywhere else I have been. It isn’t Dutch or Danish, that’s for sure, but it is also different from the other low level cycling countries I have visited. Just as Australia is inhabited by different looking animals as far as I could see Australian cycling culture is really all about different looking people, manly MAMILs (Middle Aged Men in Lycra). Yes there are hipsters on fixies. Yes there are some women and young people and even people in day clothes just pottering about on bikes. But it seems to me that they are having almost zero impact on the understanding, reporting and promotion of cycling. Throw in the image of the Prime Minister thrashing about on a road bike with his mates to show his machismo and you can see what cycling promoters are up against. 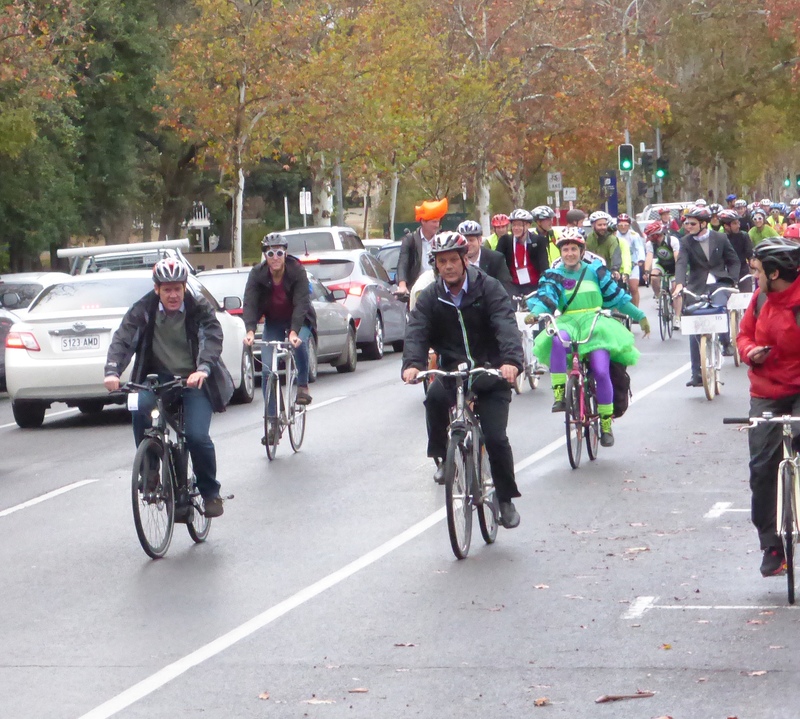 The Bike Brekkie in Adelaide was supposed to promote city cycling and most people turned up in lycra. Doh! Some of the Australian advocates were also getting just a bit frustrated with the European delegates who they said were “obsessed with helmets”. Having spent a month here I think I understand that much better. Helmets really don’t matter as much if the vast majority of cycling is a sport you dress up and something you do as an “activity” because you could take away the helmets and not much else would change. So the helmet issue is really the tip of a much bigger iceberg, the problem that so few people have any concept of cycling as a daily activity, as a normal mode of transport for short trips. I may have photographed a few people in Melbourne in normal clothes but when i observed evening rush hour the vast majority of riders were dressed for sport, not travel. And I am really not sure some of the advocates are actually helping this situation either. I reported on the “extremist” cycling infrastructure in my last post, but it is much more than that. For example almost all the advocacy organisations rely hugely on leisure events for their income. That means their image, their web sites, their brochures and their exhibition stands are covered in images of people who look like cycle racers on fancy bikes and wearing lycra, sunglasses and helmets. To me the idea that these organisations represent what we would recognise as daily cycling just seems to get lost. 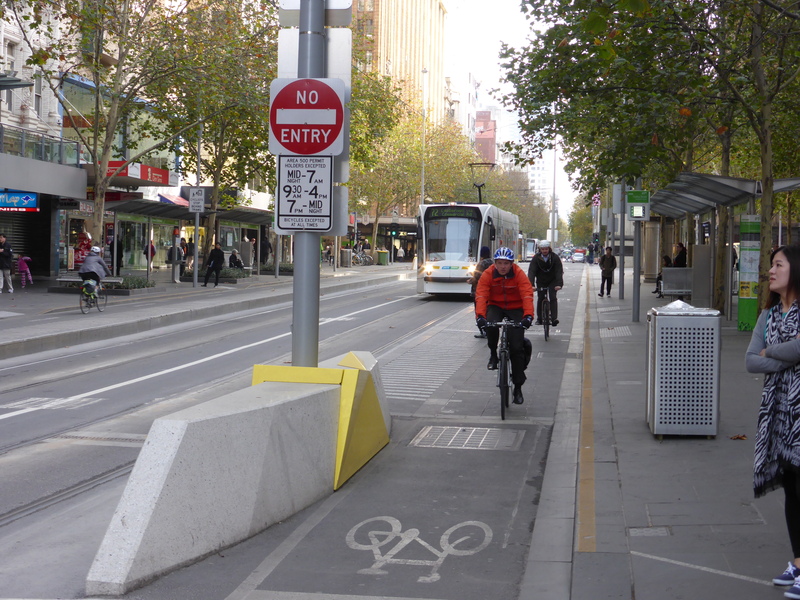 The other reason any possible cycling revolution looks different to me is because Australian cities really are really challenging places to promote cycling. As an English cyclist I didn’t enjoy cycling much 30 years ago when I lived in Australia and I still find the city layouts and transport patterns alien. In the central business districts there are grid pattern roads around huge tall modern buildings. Wide multi-lane highways leading right across the cities. And then there are the suburbs, spreading and sprawling over a huge footprint because of the amount of space commanded by both houses and the huge wide roads that links them and the many out of town shopping malls. Car use and car parking dominated every aspect of the streetscape then and it is much worse now. 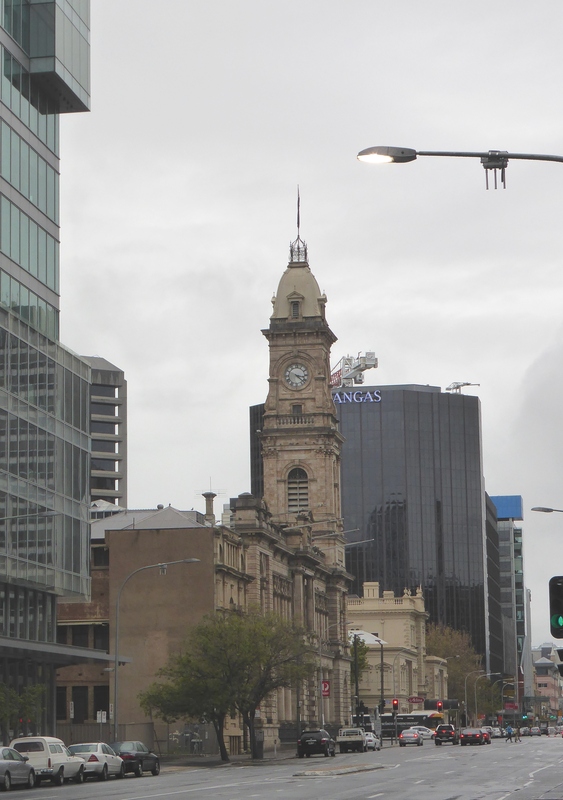 In Sydney that is worse because it is steeply hilly, and hot. Because of the colonial heritage I know some people thought Australia would be a version of Britain or Europe, just a long way away. In transport terms Britain is the easy comparison to make: they speak English, they drive on the left and they have failed to grow cycling for 30 years. Pretty obvious really. But wrong. To my eyes there is almost nothing European about this urban form, it seems to have shaped itself on similar lines to North American cities which have developed over a very similar time period. In much of Europe we constantly battle over space, here there is almost too much of it and the cities have run amok. The few cities we have like this are more likely to be in Eastern Europe than anywhere else. 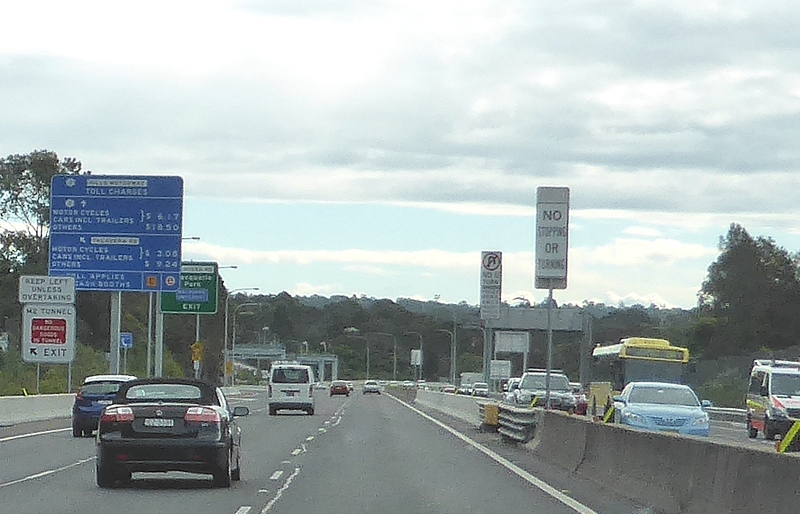 So whenever you cycle on road in Australia you have to be able to cope with extended distances because of the urban sprawl and I had to cross or turn on big multi-lane highways several times on every ride, a process that varied from challenging to terrifying, in particular in Sydney. 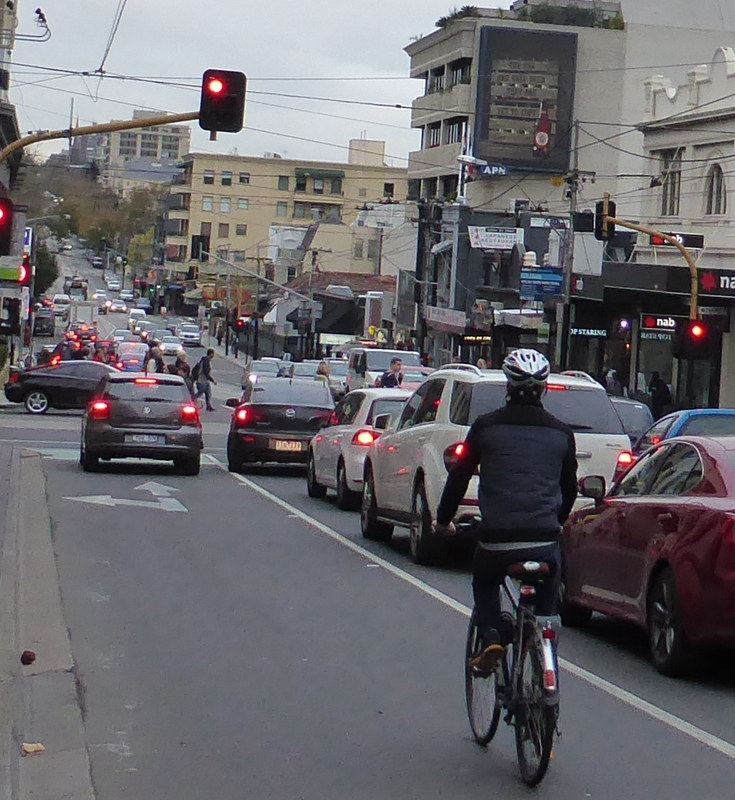 That is an impossible for all but the brave and it strikes me that without comprehensive national or state strategies for junction management cycling in Australia will be forever stuck with just the most fearless of cyclists. The existing on-road cycle lane network is frankly worse than useless as I wrote here. I’ll make just one final observation that I found seriously disturbing. One of the most important motivations for getting people cycling and keeping them cycling is the fact that cycling makes you feel better. It is fun. It makes us smile. We know there are mental health benefits of cycling. We know that according to research the health benefits outweigh the risks by factors as much as 20:1. But probably because of the compensation culture in Australia parts of the cycling world somehow seems to have let their lawyers squeeze the joy out of cycling. Take this sign beside a beautiful, smooth, car-free cycle track. Or this wording on the web site of a cycling organisation. Whatever happened to joy, spontaneity, freedom……..? 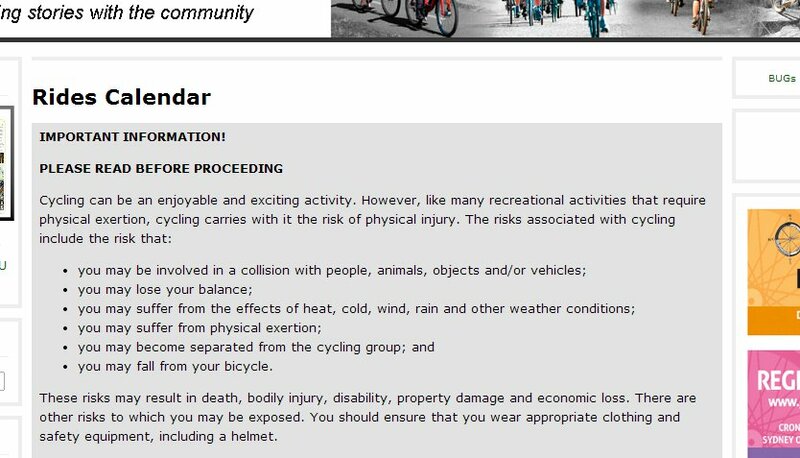 And when the cycle helmet discussion flared up in the media in Adelaide I was astonished to see on television that instead of the usual trauma doctors that we always debate with the entire debate in favour of helmets was being conducted by accident compensation lawyers. It was all deeply depressing. So what do I conclude overall? From this evidence promoting cycling as a mass activity in Australia looks like a doomed enterprise. The advocates are probably right, the cycle helmet compulsion that we Europeans see as a huge barrier is actually as more a symptom of an underlying culture where cycling is a sport and leisure activity operating in a suffocating legal climate. One international expert at Velo-city was so frustrated by all the lycra, the helmets and the accepting attitude of the advocates he said to me “I give up on this country”. I disagree. Against the background of cycling in Australia the change agents at all levels demand our respect, our support, maybe even our sympathy and certainly our encouragement because every bit of progress that they make to “normalise” cycling is a bigger victory than it would be almost anywhere else. And it can be done. The new lanes are going into the centre of the cities despite the opposition. And almost at the end of my trip I went out to Sydney’s seaside suburb of Manly. I found bikes at the ferry terminal like at a European station. And I found a whole community of laid back people just pottering about on bikes, carrying surf boards and children and generally living a bike friendly life. No special clothing, almost no helmets. It was lovely, a breath of fresh air, a real cycling treasure. If here, why not everywhere in Australia? C’mon Australia, every cycling day could and should be like this. 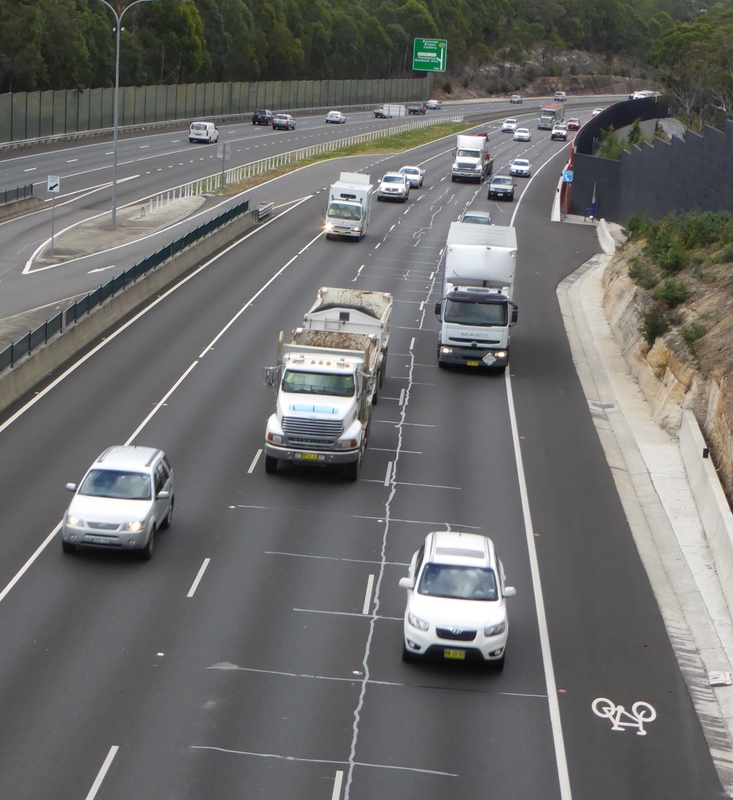 Cycling on freeways and major highways in Australia – Cycling for extremists? 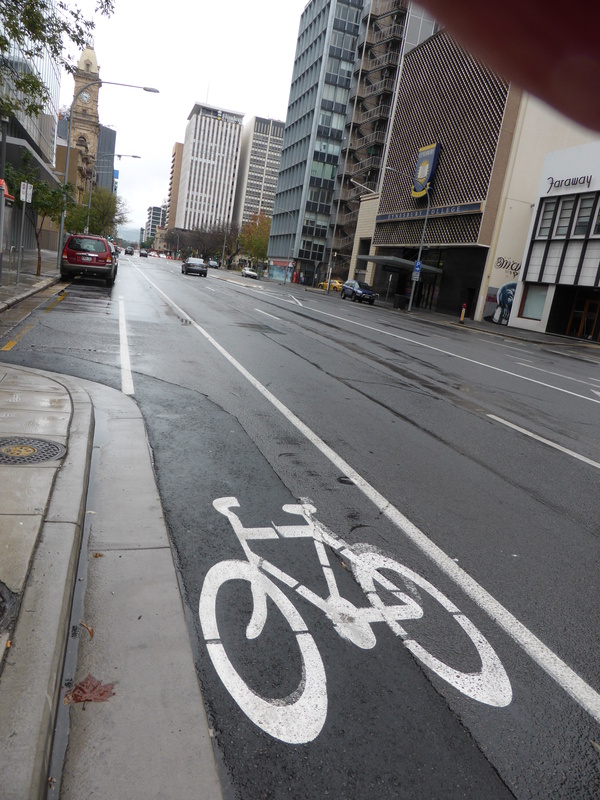 This is the second of my “what were they thinking?” posts about cycling in Australia. In my last post I looked at cycling facilities that seemed to benefit absolutely nobody. I have ridden on all sorts of roads and transport conditions over the years and I cannot say some of them were at all pleasant. But I have never seen cycle lanes for fanatics built into the cycling culture as they were here. So this is today’s subject. I’ll start the post with some examples. But then as we were driving along an odd image caught my peripheral vision. 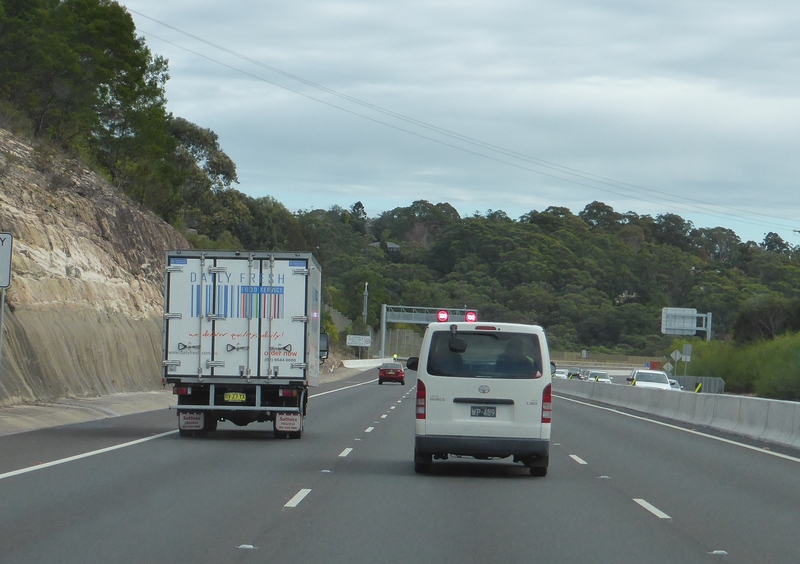 I grabbed my camera because I couldn’t quite believe my eyes, apparently in the emergency lane was a cycle lane marker. 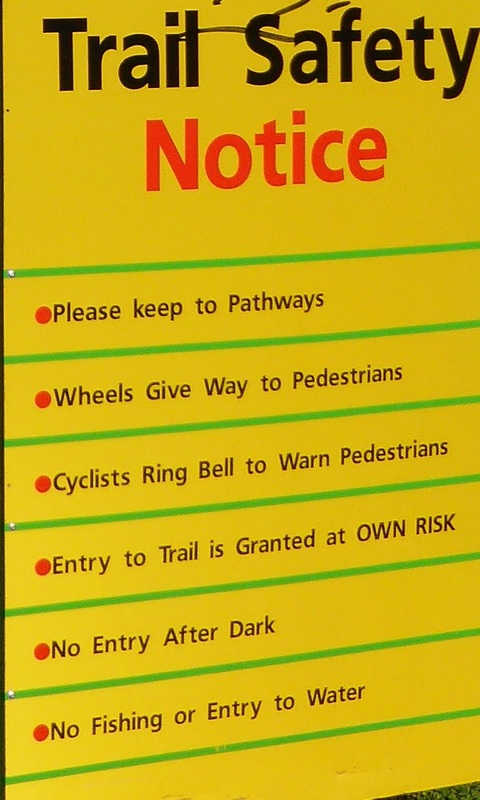 Not only that, further on there were signs clearly showing that this was an officially designated cycle route. I was stunned. It wasn’t until the third or fourth time that I travelled that freeway I saw an even more unusual sight. Just in the distance I could see this tiny yellow dot. And of course as we got closer it turned into a cyclist, the only one I saw on the route. On other train and cycling trips I crossed the M2 and I managed to capture some additional pictures of this remarkable cycle route along one of the busiest highways in Australia. I never did see another cyclist on it, yet later on I actually found it listed on the New South Wales cycle routes map and it is the very first listing on the Wikipedia page for Bike Paths in Sydney. I almost laughed out loud when I read the description of the M2 Hills Motorway route on that Wikipedia page. It said cyclists were “poorly served” by the route. That’s the kind of language Dutch cyclists use to describe a cycle lane that has a less than perfect surface. “Poorly served” does not mean “left exposed in conditions so frightening almost nobody dare use them”, except perhaps in the mind of this small group of Australian cyclists who just don’t see this as abnormal. 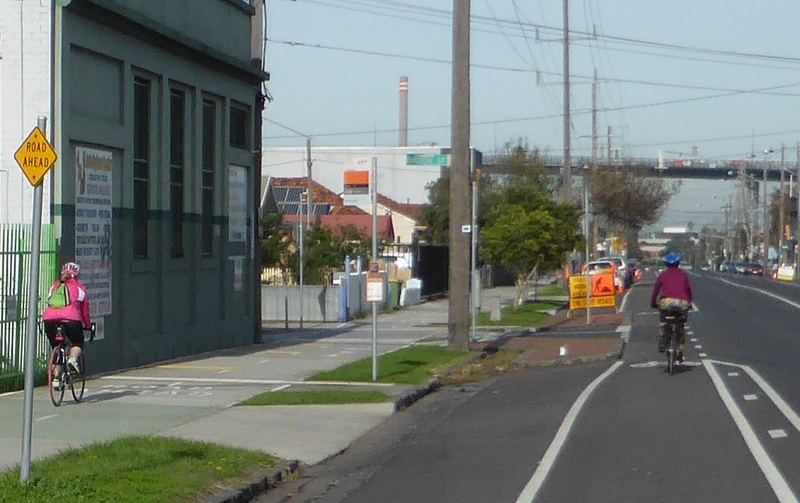 Melbourne’s magical mystery cycle lanes. 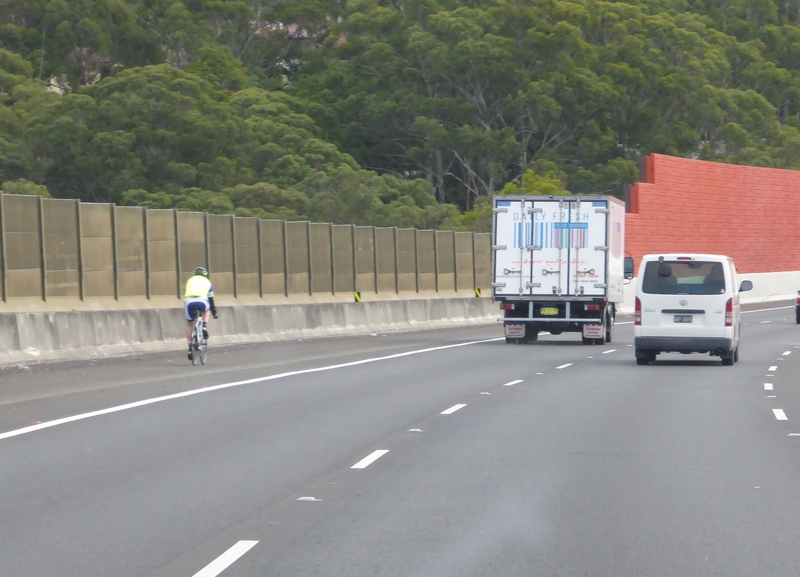 Sydney wasn’t alone in catering for cyclists on its major highways. 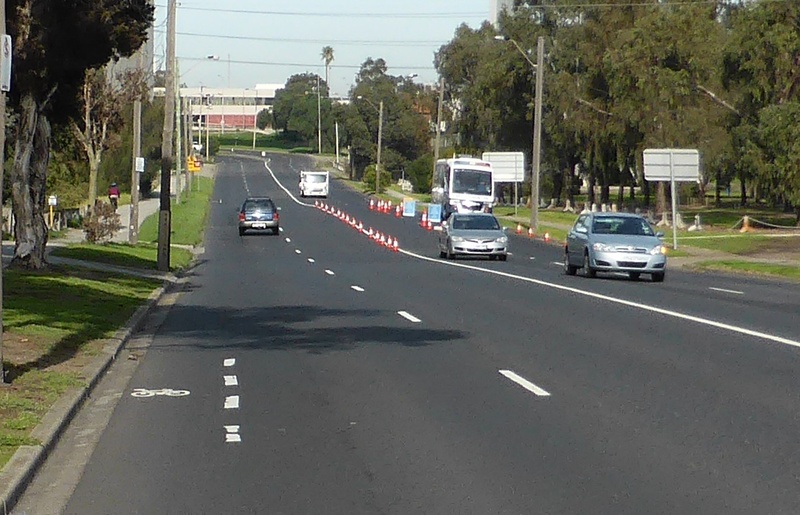 Although the Victorian freeways were clearly cyclist free I did see similar “facilities” for cyclists on some of the other major multi-lane highways around Melbourne. Allied to this were some very odd cycle lanes on larger suburban multi-lane highways. I have absolutely no idea whatsoever what this marking is for, but it was relatively common on the sort of road where I would think no sensible cyclist would want to be. In one case the strange markings even existed in parallel to a segregated cycle way. Ok, “sporty” cyclists may have wanted to be on the smooth asphalt but why they needed a 2 metre occasional paint splash to tell them that I have no idea. So why? I was staying in the North Sydney suburb of Beecroft which gave me access to some great rides in the Sydney’s Ku-Ring-Gai Chase National Park. The only problem was that these suburbs are traversed by some of the most hostile roads I have ridden in years, even if I stayed off the M2. 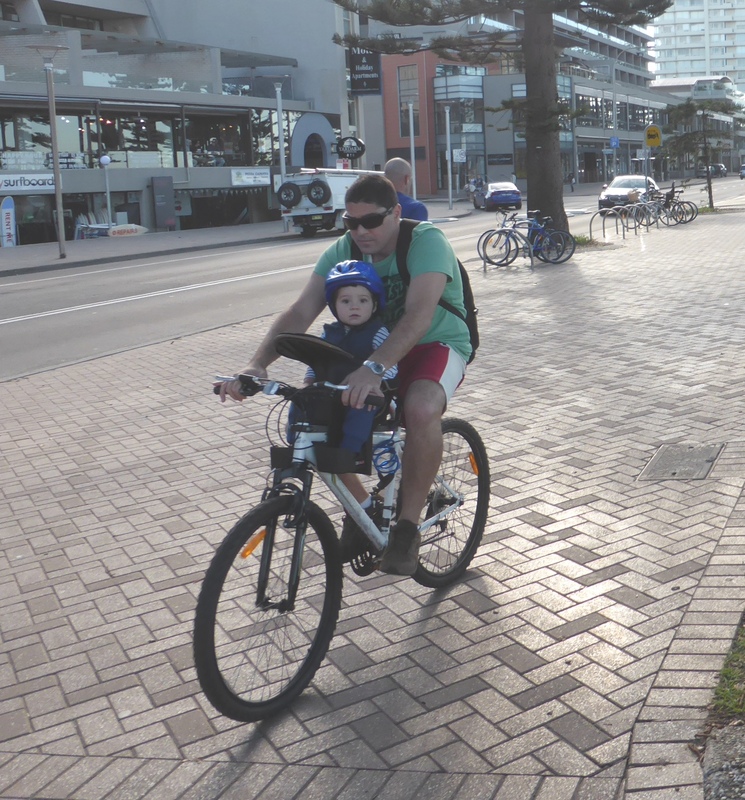 However it appears that others in Sydney regard these roads as perfectly cycleable, in fact there are encouraging “facilities” to make this possible. 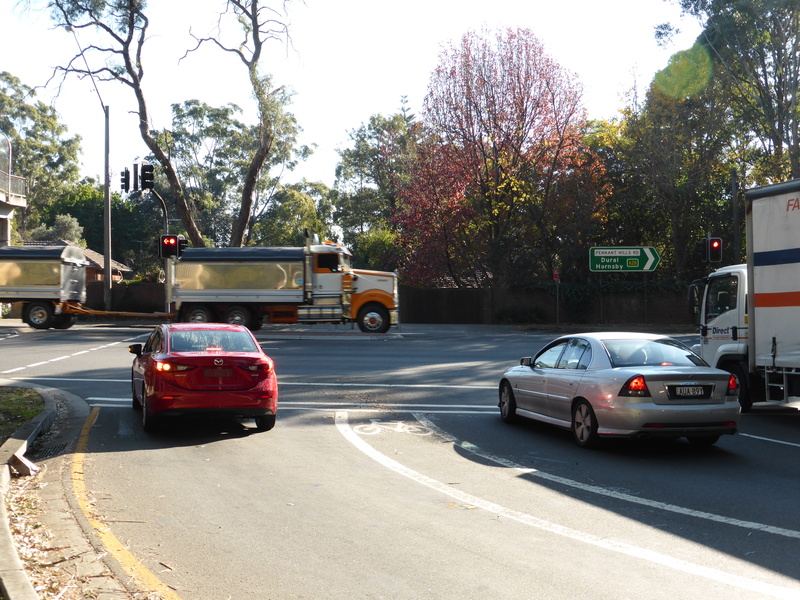 My first experience was the access from Beecroft Road onto the Pennant Hills Highway. 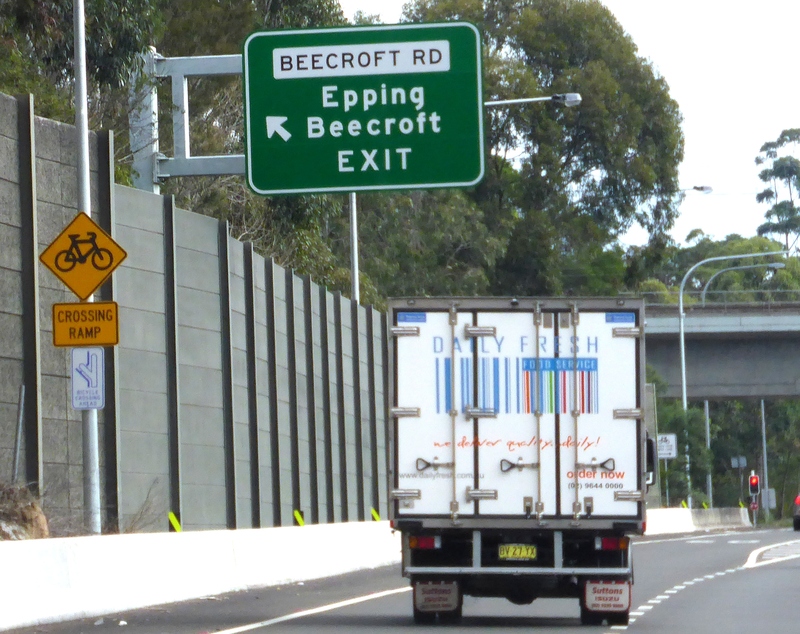 Beecroft Road itself was pretty horrible, but it was the only realistic way out of where I was staying so I gritted my teeth and rode up it. I was more encouraged when I got to my first junction because there was a warning sign for vehicles to look out for cyclists and then a cycle lane. Hopefully that meant better cycling on the other side because clearly this had been planned? How innocent I was. Sydney readers will have got a clue from the photograph itself. 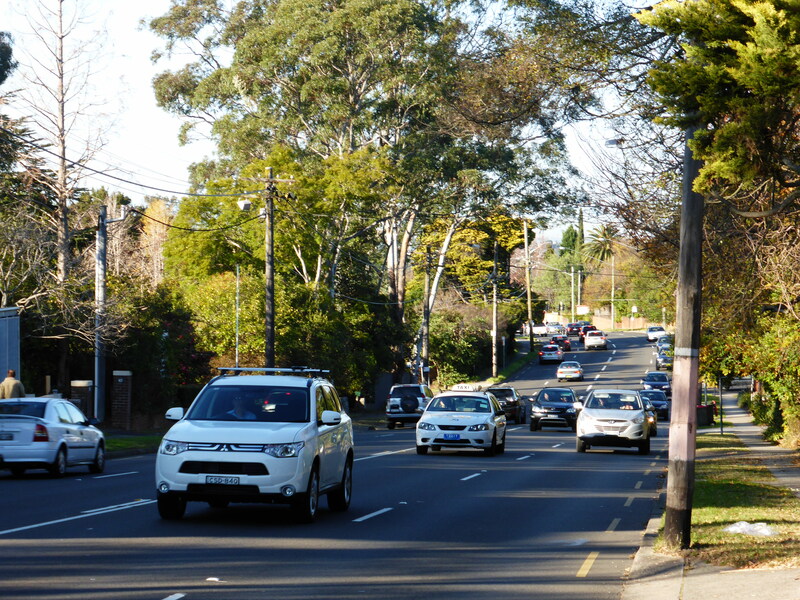 This was a junction with Pennant Hills Road, one of the most unpleasant and unwelcoming roads in Sydney, six lanes of nose-to-tail commercial traffic. Once I crossed that junction there was just nowhere to go except a six lane highway which was just horrible. I stayed only a few hundred metres before I took the first available turning off and reconsidered my options. 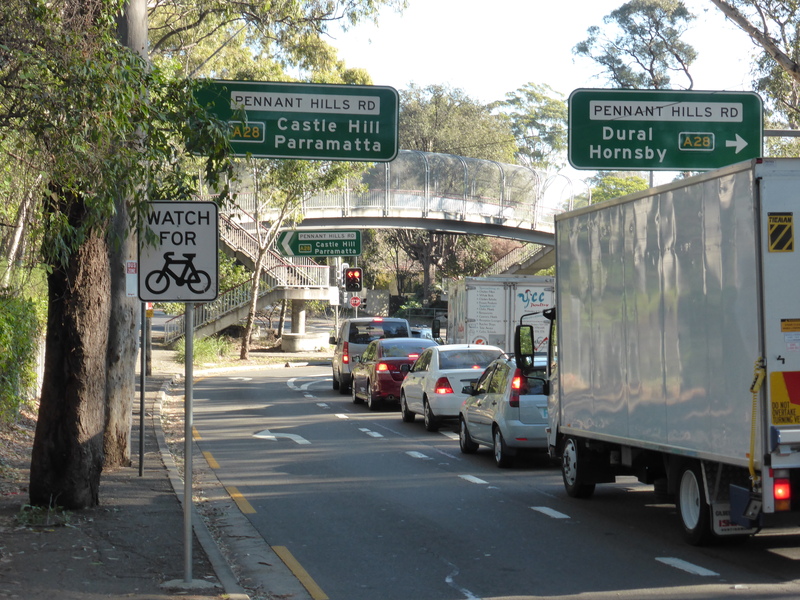 I had no choice but to follow Pennant Hills Road for a short distance on a number of my rides and on each occasion I used the sidewalk (pavement) to get between junctions even though I was on a quality skinny-tyred road bike. I later spoke to quite a few people and was told that almost all cyclists used the pavement, including group rides from Beecroft. So why anyone felt it was worth putting a cycle lane on any junction that joins Pennant Hills Road I have no idea, clearly what was needed was some realistic guidance and help to get across and away from this monstrosity, not an invitation to ride? 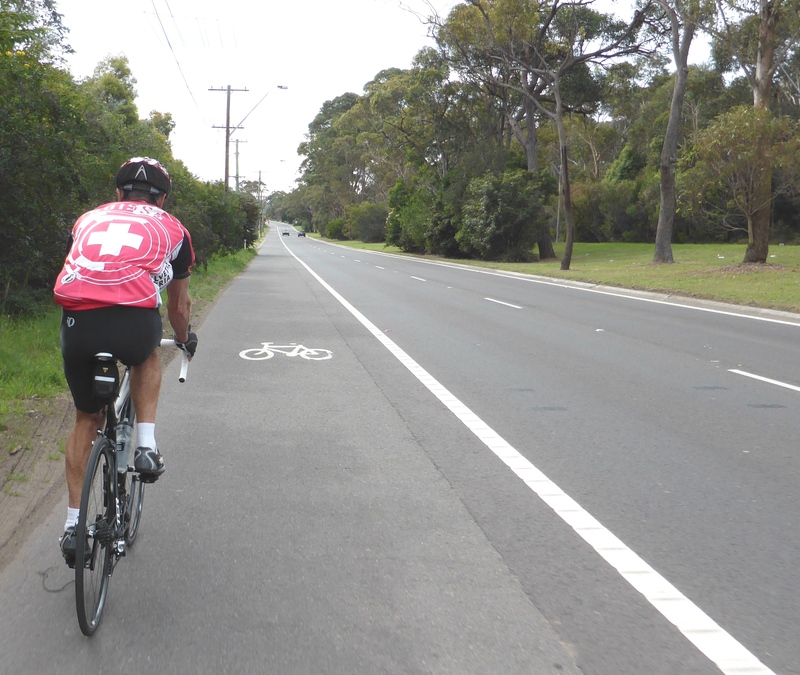 I also mentioned Mona Vale Road in my write up on three great rides in Sydney. 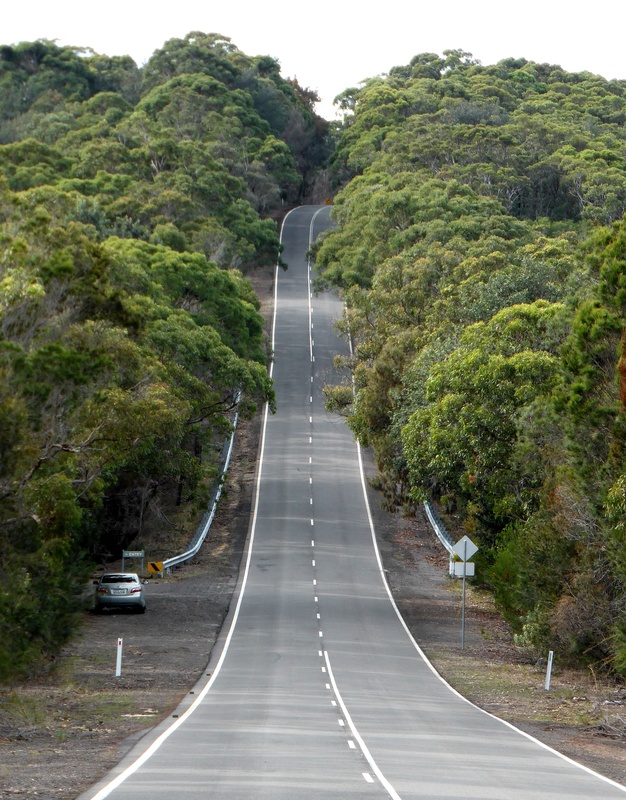 As well as having to cross Pennant Hills Road this was my main access to the fantastic West Head Road in Ku-Ring-Gai Chase National Park. It is a bit different to the other examples because this was recommended to me as a “popular cycling road” because “you always see cyclists up there”. 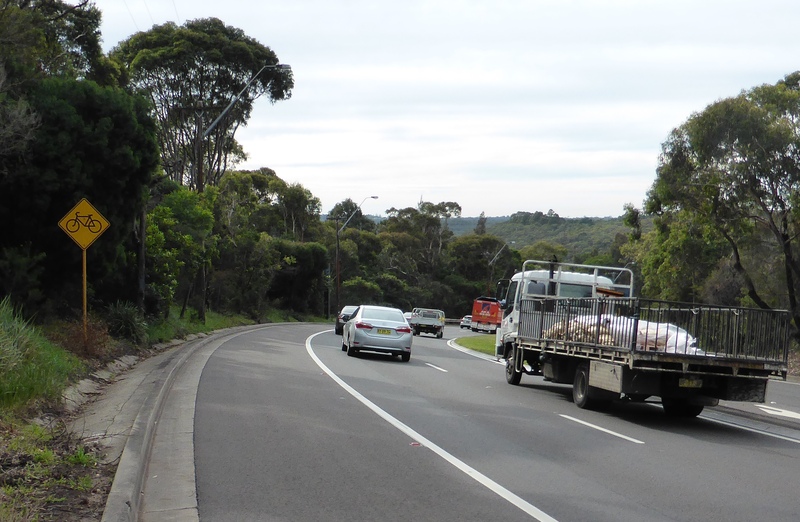 It was actually the “no choice whatsoever” route because getting from Beecroft to the national park or the nearby bays and coast offers no alternatives for cyclists, cars or commercial vehicles. So of course we all go together. That’s sort of ok when there is a big wide safety lane on the left, although it’s not exactly enjoyable. But when the lane just disappears, the only protection is a small sign and traffic is doing 100kmph past your elbow. I saw some cyclists and I slipstreamed one chap for a short while. He stopped just before I turned off and said “I turn back now”. 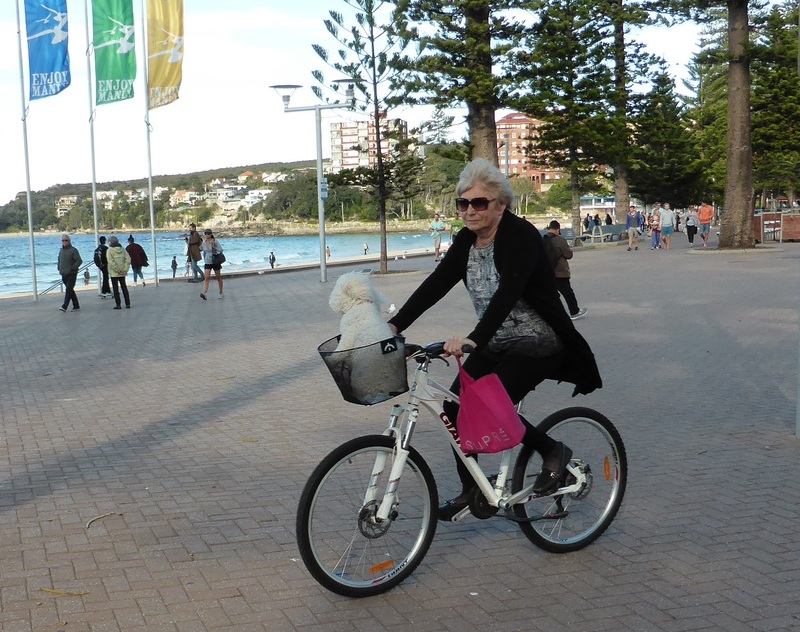 I now realise that his choice of bike ride was to thrash up and down Mona Vale Road and he actually turned back just before the opportunity to ride an attractive, quiet car free route. I couldn’t do it, I would lose the will to live if that was one of my regular rides. The second time I cycled in this direction I got a lift to the start of my ride. My final example doesn’t have any photographs. At around 6am on a Saturday morning we got our final lift from Beecroft to Sydney’s international airport. It was pitch dark and overcast, not a great day. As we moved along the main dual carriageway towards the airport around 7am we pulled over to pass a slow moving vehicle driving with flashing lights. In front of it was a group of cyclists clearly out on a training ride. Just nearby was another group precariously stopped by the roadside, this time without support vehicle. I had heard that some racing cyclists in Australia go to extraordinary lengths to get some training before the roads get busy. Now I had seen them in action. Absolutely terrifying. Apparently 7 riders were hurt in a collision with a car on one of these rides recently. I hope last Saturday’s riders did have somewhere better to go, and that they got there and back safely. 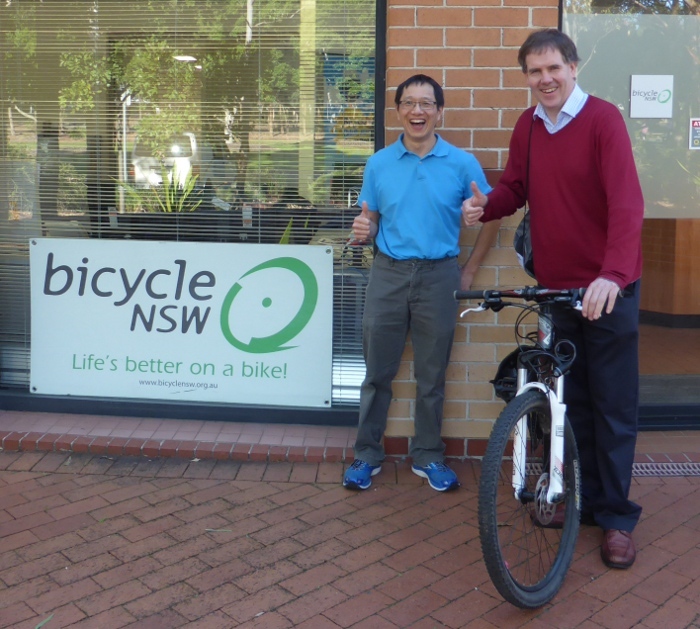 I spoke to cyclists in Melbourne and Sydney including advocates and sports cyclists as well as leisure riders. Nobody at all said they used the roads where cycling is combined with high speed traffic. In particular the M2 Freeway attracted a “no way” response. I know elsewhere in Sydney and Melbourne they are gradually building high quality segregated cycle routes, even along the major highways. 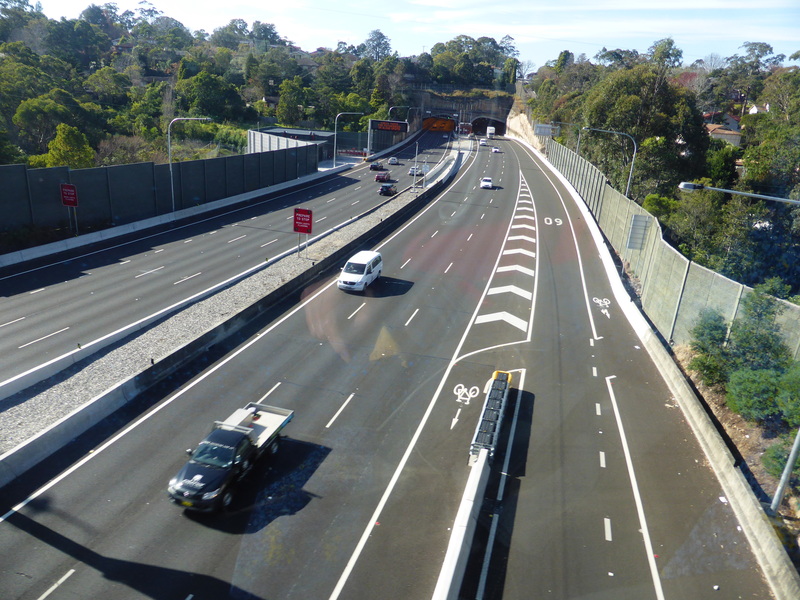 In particular the cycle route that follows Sydney’s M7 freeway gets rave reviews for being high quality, well designed and entirely protected from vehicles. Interestingly most cyclists I spoke to in Sydney said they knew people who did use the unpleasant routes and there are even cycling advocates who regard the M2 Freeway cycle route as an essential part of their commute. This had once been a segregated parallel route to the motorway but the segregation had been lost during road widening and other changes leaving only the emergency access lane. 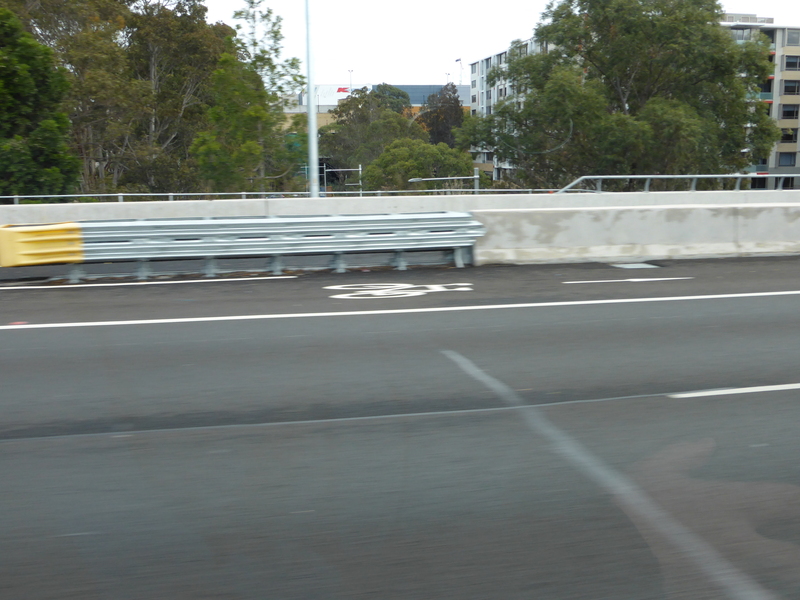 Some cyclists fought to keep use of it because the motorway actually provides one of the only fast, direct and relatively flat routes into the centre of Sydney. The alternative is apparently much slower and in their eyes more dangerous, but is extraordinary to me that advocates will campaign for a facility that is usable by just a tiny rump of the cycling community. I have to say a tiny minority because cycling is not a major means of transport in Australia. 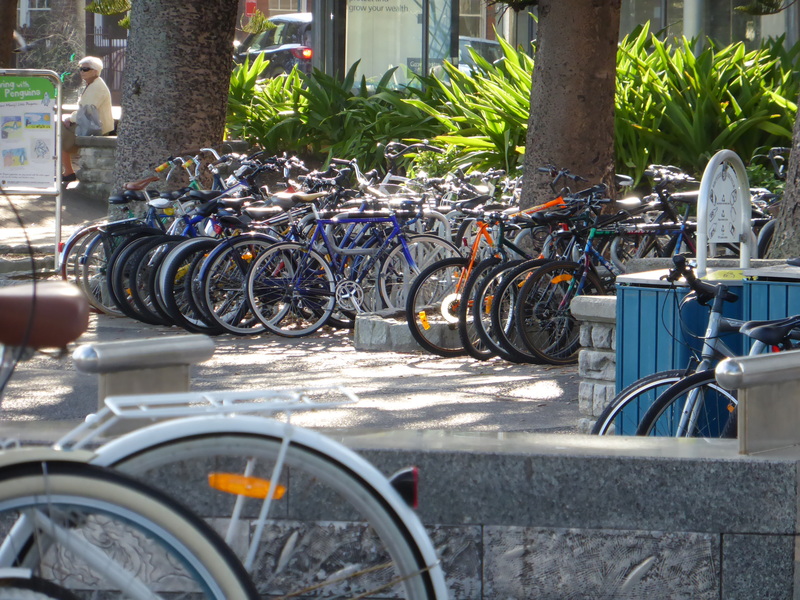 Mode share in Sydney reaches 3% in some suburbs but overall is just 1%. There is a bigger recreational community but it is still small compared to many European countries. But within this group majority of people who cycled that I spoke to were not going to use the high speed routes. So the number of major highway users must be very small indeed. Every time I think about this I am drawn back to an excellent analysis of cycle users and potential cycle users that came originally from Portland in the US. It is now widely used because many people in the cycling world believe it is a very useful indicator of people’s attitudes to cycling on a much wider basis. According the analysis about 1% of cyclists will cycle under almost any conditions. They include many sports cyclists but also include urban warriors who handle challenging traffic anywhere in the world. 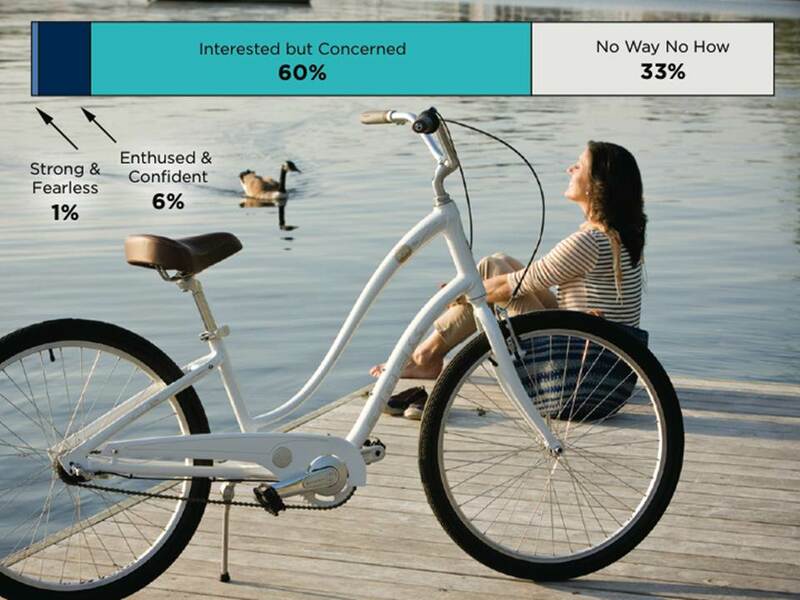 A further 5-6% are enthusiastic about cycling and have the confidence to tackle a lot of different riding conditions so they will cope with vehicular cycling but prefer some provision. Then there are the vast bulk of the population who actually have a positive or at least passive view about cycling. They would ride if conditions are safe, but generally they have concerns that must be dealt with before they will ride. Now in here in Melbourne and especially in Sydney I have found that the fearless cyclists group has at its head another even smaller minority. We have a comparison in mountain biking, they are the extreme downhillers, doing stuff even the brave decline. If they were a Tour de France mountain they would be “Hors category” – beyond measurement. I am sure in Sydney some would argue “we have no choice” and from what I saw of suburban North Sydney I would have some sympathy with that view. After 10 days I could only conclude it was one of the most unwelcoming cycling environments I have ever experienced. However these cycle lanes made absolutely no difference to that impression, so I have no idea why they exist and even less understanding of my public authorities were convinced that these cycle lanes were worth spending money on. I cannot help but feel that any effort to incorporate extreme cycling into the highway system undermines the possibility that cycling could ever be treated as “normal”. Surely it competes directly with the great efforts being made elsewhere to create high quality infrastructure that can be used by 60% of the population, not 0.01%. Ihope that all the work we did at Velo-city in Adelaide has encouraged and inspired the people who are making the new cycling facilities because they really are working against an extremist cycling heritage that will take a lot of unravelling before cycling can be an enjoyable activity for the majority of people. I Do Not Despair is about being positive about cycling, travelling to places by bike and enjoying the company of cyclists. But sometimes I just see things that make me ask “What were they thinking?” In Australia I had some great rides but I found many examples of cycling facilities that seemed spectacularly ill-conceived and designed. 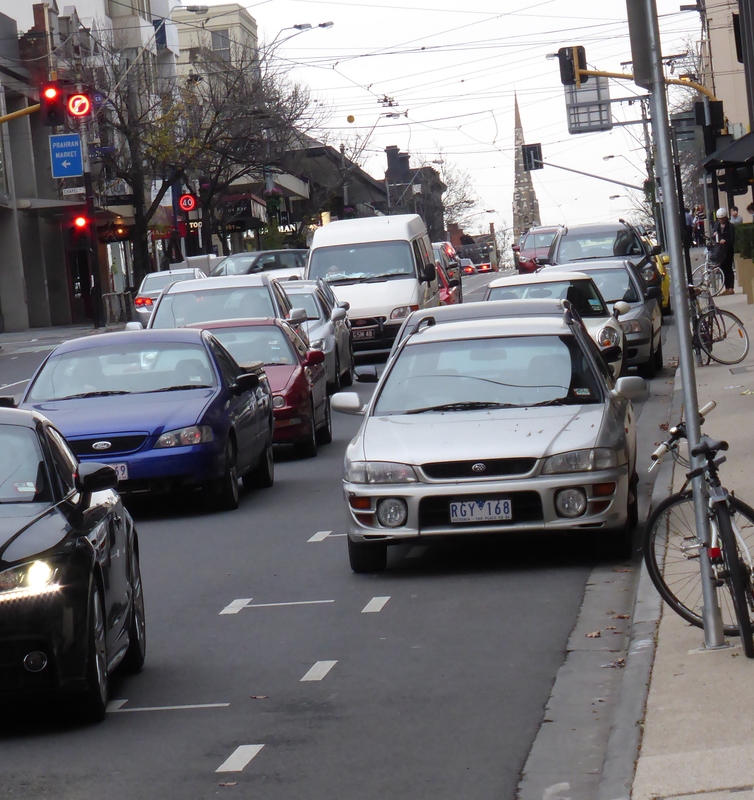 In both Melbourne and Sydney the most common example was “dooring zones” and in Melbourne they were joined by “part time” cycle lanes. They probably have some other official term in the minds of the people implementing them but these were my phrases, although I could have called them a lot worse. I think they fail the test for cycling provision in the most important way of all. They are of absolutely no benefit to anyone – there is no “design user” and as far as I can see no road safety benefit at all. In fact even worse, these sorts of facilities create user conflict and badly educated cyclists which in the long run makes the cycling experience worse for everyone else. Highly experienced vehicular cyclists don’t need them because they are confident riding on roads and should be riding out in the middle of a carriageway to protect themselves from close passing cars. New or less confident cyclists get absolutely no benefit whatsoever because they offer almost no psychological or real protection from busy traffic, leaving the cyclist exposed and afraid. And if that is the case they are a surely waste of public time and resources? Let me take the “dooring zones” first. 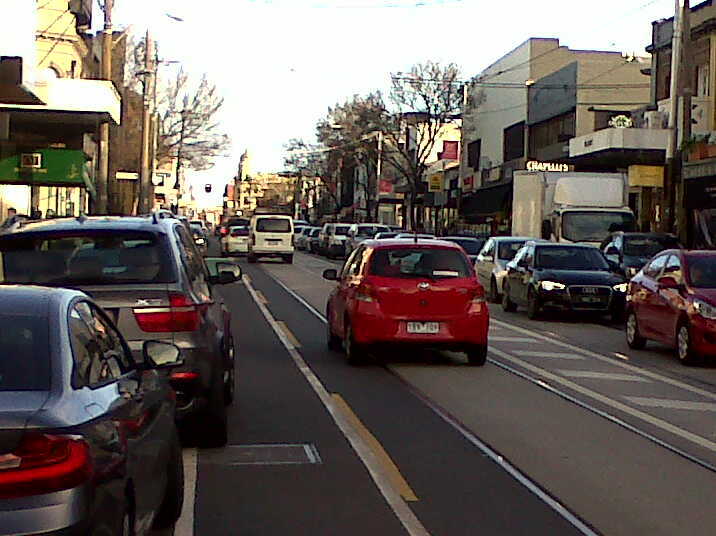 During side chats at Velo-city and even more in my reading of Australian cyclists social media and blogs I kept coming across lots of comments about “dooring”, the highly dangerous practice where a car user opens the door of a parked car into the path of a cyclist. Most regular cyclists know about this one. I have had it happen twice in fourty years of riding and got away with minor injuries but I know of some horror stories. And there is no doubt dooring plays on your psyche when you ride again, indeed many people never go back to riding, but after a near miss or two you learn to keep your distance. 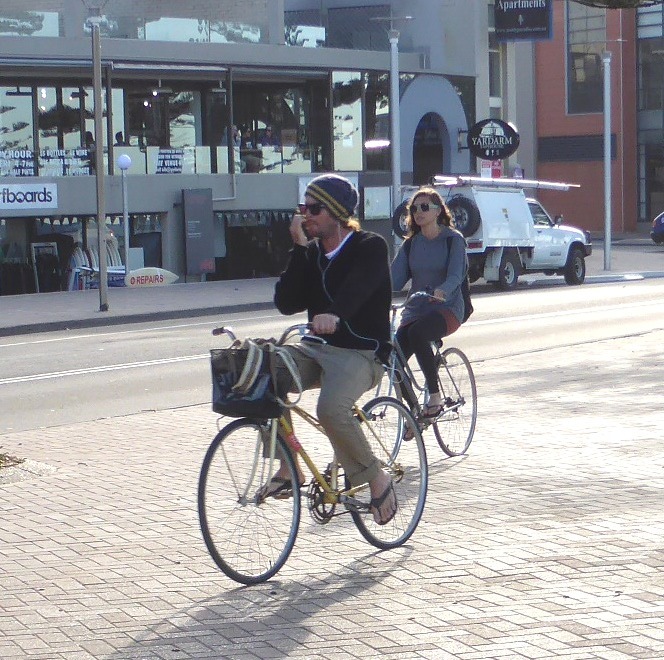 I saw one or two examples of bike lanes outside parked cars in Adelaide, but generally they were wide enough to allow the user to ride well outside any risk. I couldn’t really understand the high profile concern about the subject among the Aussies. Then I got to Melbourne and I was astonished to see with “dooring zones” on my very first day and subsequently I saw them all over the place. 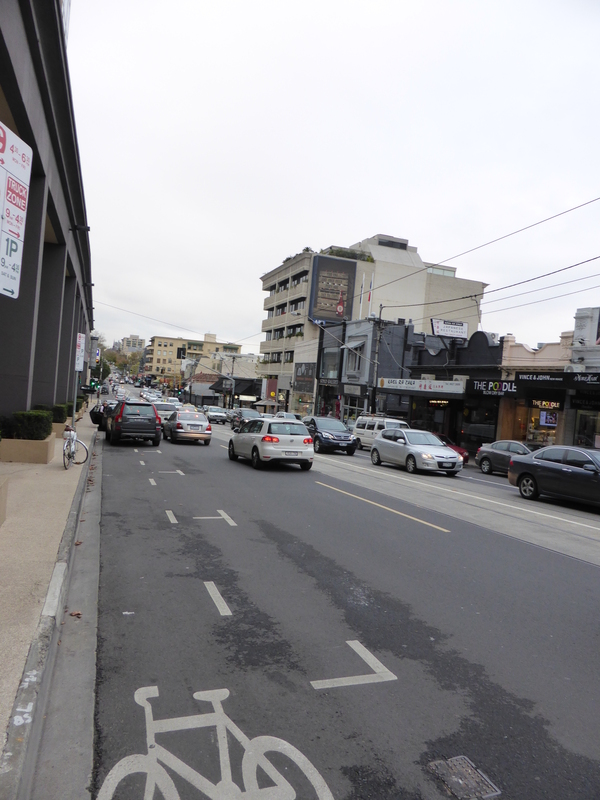 Then on many of the roads I cycled in Sydney they were like a plague and of consistently dangerous designs. 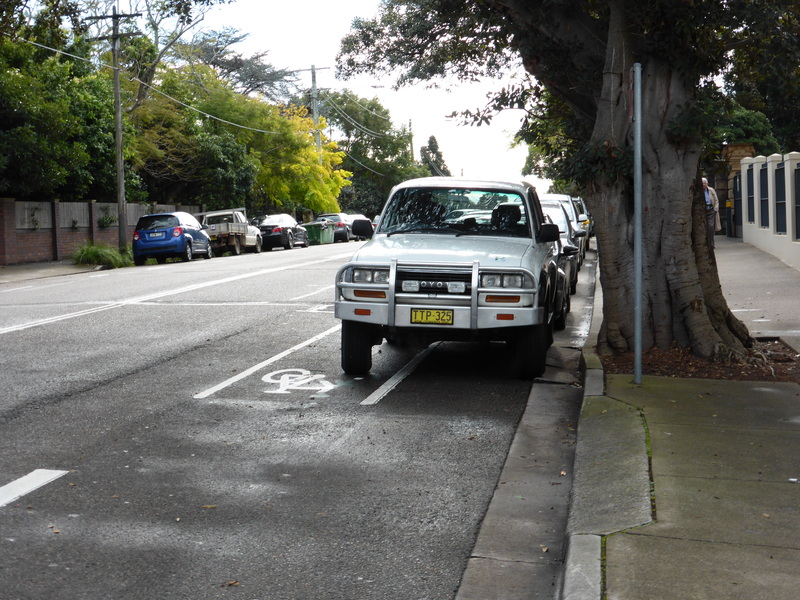 In Sydney I didn’t only find a defined cycle lane outside the parked cars, in most cases the bike lane was just a parking lane, only slightly wider than usual. This means a great space some of the time but an unpleasant slalom course around the parked cars that are present most of the time, again risking the ire of motorists on the main lane who don’t know how to interpret my moves when I had to pull a bit wider round the vehicles (which was most of the time.) I got shouted and hooted at a couple of times. No pictures? Sorry, too busy surviving. No wonder this is a major topic among Aussie advocates, these are appalling, almost to the point of being lethal. Why motorists and cyclists alike have not succeeded with legal cases against the councils involved for causing risk and harm to road users is beyond me. Putting a bike lane right up against the side of parked cars, and indeed allowing it to be further narrowed by cars parking badly is an official signal to cyclists that this is where they are supposed to be, despite the fact that this is completely and utterly wrong practice in every sense. And to compound the problem any sensible cyclist who avoids the risk of dooring by moving out into the main lane is seen by motorists as being “in the wrong place” invoking further antagonism between users. It could only be worse if this were somewhere like Belgium where the bike lanes are compulsory. I even found one dooring zone retained on the roads when a reasonable quality separated lane cycle lane had been built adjacent, so somebody must think they a continued place in cycling. I don’t get it. Crazy design number 2 is the part-time cycle lane. I first discovered these on Toorak Road in Melbourne. 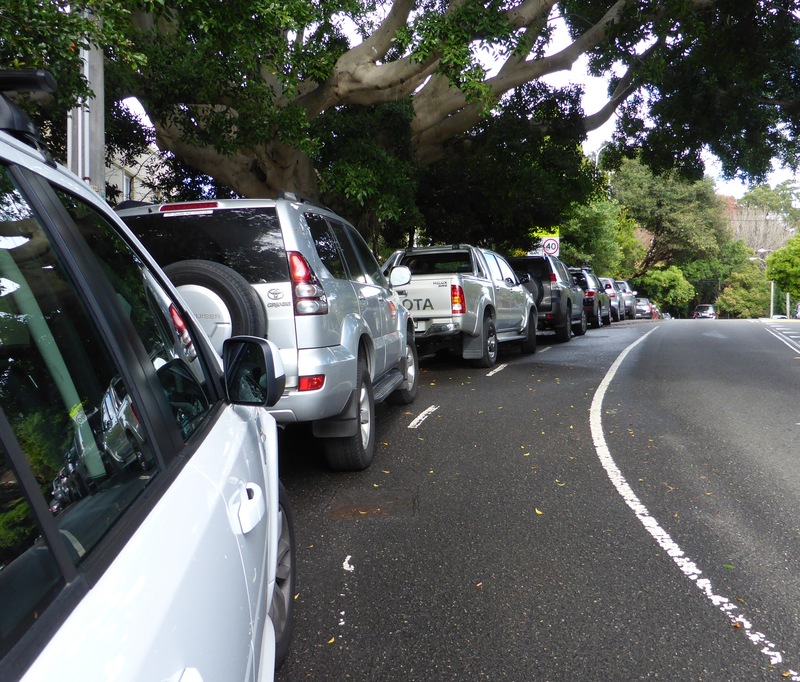 At first couldn’t work out what I was seeing, I could see a cycle lane but it was covered in parked cars. So naturally I assumed this was an old fashioned parking enforcement problem, a lack of political will to enforce the rules. Ok we all get those, but this looked particularly bad. Then I saw a sign that said the parking was prohibited at rush hour, opening up a third lane on the inside of the road and enabling the cycle lane to appear. As if a magic rabbit has been drawn from a hat the cyclists are now welcome and indeed encouraged on this road, but only if they are prepared to take on two or three lanes of rush hour drivers who are the real and intended beneficiaries of the removed parking. So in the eyes of the transport planners there must be two presumed states of cycling here. There is the 22 hours per day cyclist who needs no cycling facilities. And then for 2 hours per day these poor lambs suddenly are given a bit of paint and a metre of the lane. This is of course complete and utter nonsense, cyclists don’t just exist two hours per day and they don’t need bad protection in rush hour, they need good facilities, or continue with none at all. These stupid lanes were just no use to anyone. As far as I could see they were sensibly being ignored by the few cyclists using these roads who were generally confident and took the whole lane to keep themselves safe from motorists trying to squeeze by. I saw nobody who I could categorise as a less confident cyclist. The photo below is a perfect example. 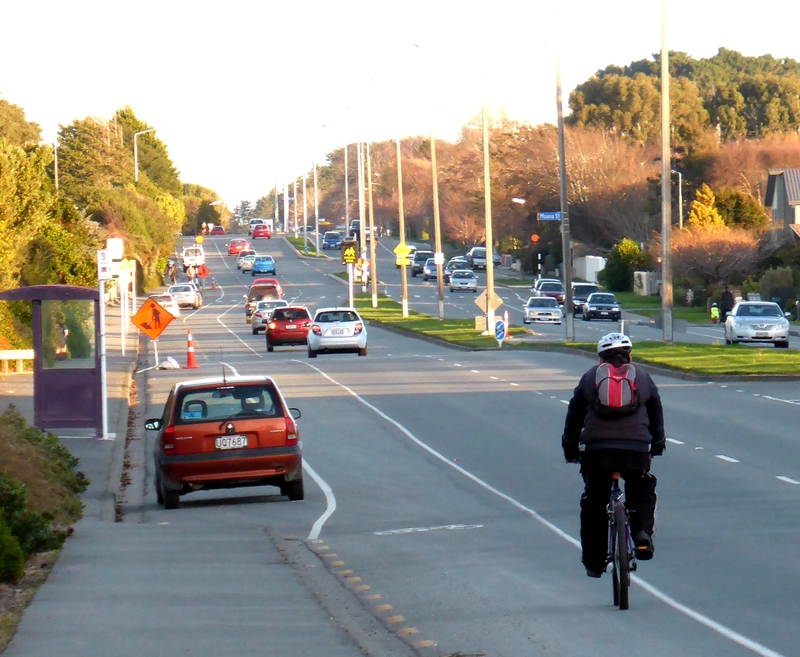 I would regard the positioning of this cyclist as exemplary for this sort of multi-lane road. But look ahead and his lane disappears actually into nothing, while underneath the cars there is a paint line that supposedly will push him to the left during rush hour. Useless and dangerous. But I cannot see how anybody in Melbourne or Sydney could possibly better off with the dooring zones and part time cycle lanes I saw. Sadly I believe they probably make the environment for most cyclists much worse. Some high quality facilities are being installed in the centre of both cities but it doesn’t take away the problem of what you have to ride through to get there, after all a safe cycling trip is only as good as its weakest link. The question remains. “What were they thinking?” I do despair – sometimes. Coming next “Cycling on Freeways”. Seriously. 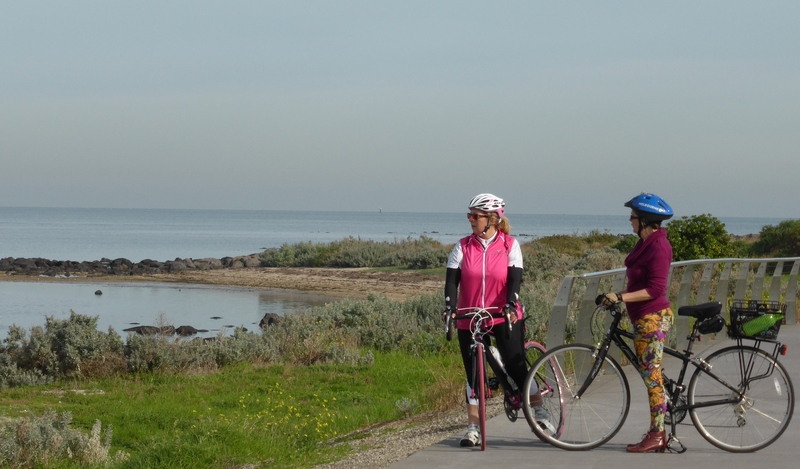 Melbourne provides all the ingredients for a great bike ride – good company, great route, brilliant weather.